(Ursus americanus) Black bears are not indigenous to Southern California. They were imported from Yosemite and introduced to the San Bernardino National Forest when the indigenous Grizzly Bear was hunted to extinction in the early 1900’s. Our black bear have all been rescued and are happy to call Big Bear Alpine Zoo their home. Black bears are omnivores and will eat just about anything. In the wild, the majority of their diet consists of vegetable matter including roots, nuts, berries and grasses. Black bears live about 15 to 25 years in captivity and much less than that in the wild. Black bear cubs are born in January or February while the mother is in the den. The litter size is anywhere from one to five cubs, but five is rare. American black bears are found throughout North America. Black bears are not always black; they range in color from a deep black to white, found on the Kermode Island. Black bears are not indigenous to Southern California. They were introduced to San Bernardino from Yosemite when the indigenous Grizzly Bear was hunted to extinction in the early 1900’s. The Big Bear Alpine Zoo currently has 4 resident black bears. All of our bears are rescue bears that are unable to fend for themselves and cannot be released back to the wild. Zuni – Our oldest bear came to us in 2000. He was found in Barstow, orphaned, starving and too young to survive on his own. Hucklebeary – Our three legged bear came to us in 2002 as a cub, after he was hit by a car and his leg was so severely damaged it had to be amputated. He was very young at the time and we weren’t sure he was going to survive, but he is doing great and has adapted very well to only having three legs. 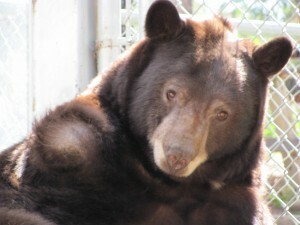 Hollybeary – Our only female bear came to us in 2005. She was left on the doorstep of a rehabilitator when she was about 3 or 4 months old. She had a very severe skin condition that took months to resolve, but she is beautiful and healthy now. Hollybeary was bottle fed for several months after her arrival and she is now dependent on humans for her survival. Pooh Bear – Came to us in 2012 when he was probably about 5 years old. He is the darkest black bear we have and he came to us from Fish and Wildlife. He had destroyed $8000 worth of bee hives and eaten the honey so he could not be left out in the wild since he seemed to have no fear of humans. He has a wonderful temperament and is settling in nicely to his new home.